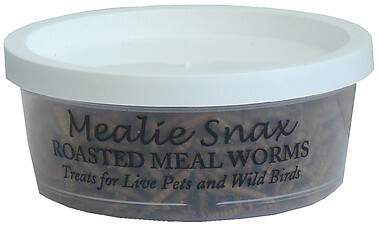 Mealie Snax are dry roasted Mealworms that Blue Birds and other wild birds will love. Some reptiles, turtles and frogs will also eat Mealie Snax. Keep refrigerated for a long lasting food source. 16 Oz Cup 2000 Worms $15.96 Free Shipping! 72 Oz Cup 10,000 Worms $40.04 Free Shipping!